I’ve consulted the archives and lo! this circle-in-a-square granny project has been with me for one year and two days. The amount of effort, bored to tears-ness, lessons learned, queasy, car-sickened craft that has gone into this little number is immeasurable, incalculable, infinite. I am gobsmacked at the uncharacteristic, marked restraint: to date, I have posted but five times on the sucker. One year and two days on, I have crocheted 180 squares, retro-fitted a flat braid join (one of the lessons learned) and woven in eighty seven squares worth of ends (so, approximately 12,467). I will admit to wildly enjoying the first third of this process. Such is the angst now associated with this work in progress mocking me from the sofa in various states of incomplete, I am inspired to start a meme. How about this? WEAVING IN WEDNESDAY! 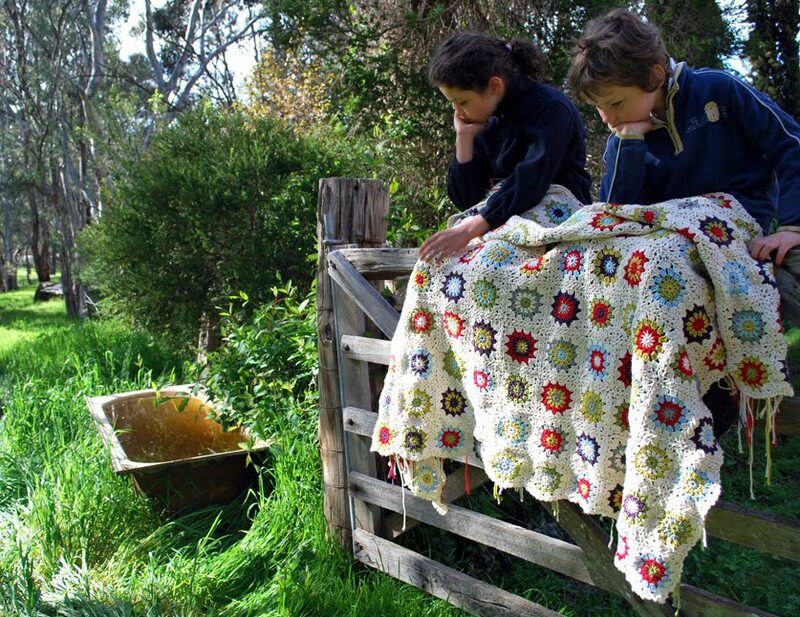 * The mid-week, ‘hump’ day, forever more associated with finishing granny blankets? 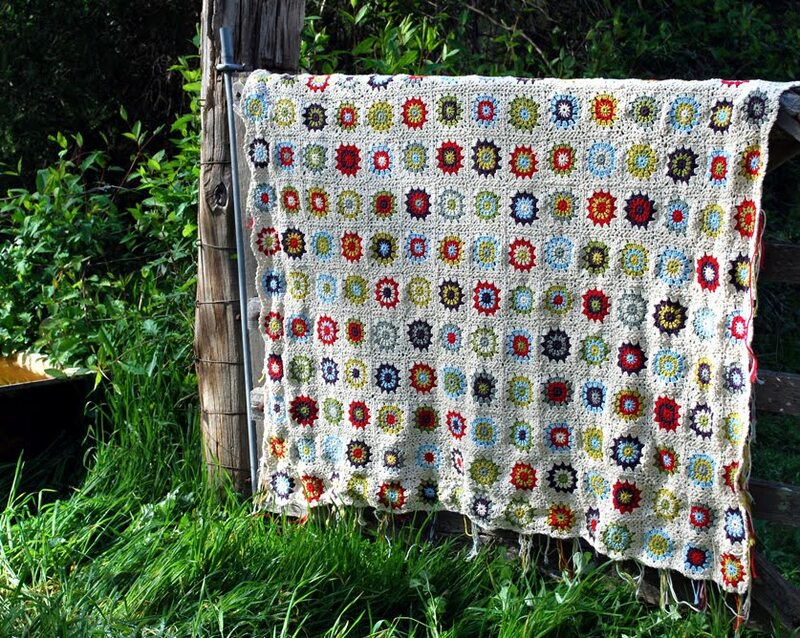 Whole weekly blog posts devoted purely to the intricacies of weaving in granny square ends. ** Anyone? Needless to suggest, familial enthusiasm for the project has waned. Photographic posing requests prompted much in the way of tongue-in-cheek eye rolling and melodrama. All of which had me shrieking with laughter and re-inspired to finish, dammit. If only to inflict one. last. photoshoot. upon my poor, put-upon poppets. I thought you had lost your mind- with the meme. Others have learnt lessons from this ordeal too. 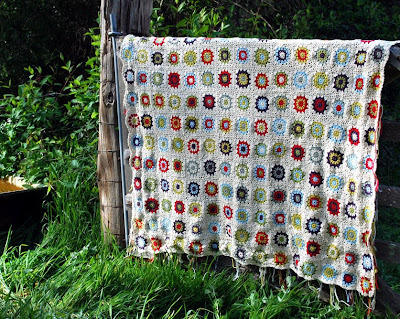 ( by the way it looks gorgeous) I KNOW I will never ever ever ever ever start even one granny square because I know I will makes hundreds but never want to put them all together. So really this has been a community service. Oh Tania. God I have so much crochet envy. But I will not be weaving on Wednesdays. I will be sure to come over here and comment on your process if you do though. I also have contacts nearby that can come and check on you on those days... Bring casseroles to your family, etc..
P.s speaking of them is it just me or are your kids growing? I surely do look forward to your meme as you know I have enough fodder to fill two lifetimes. Besides...I could post the same image each & every post & tell you it's a new square! 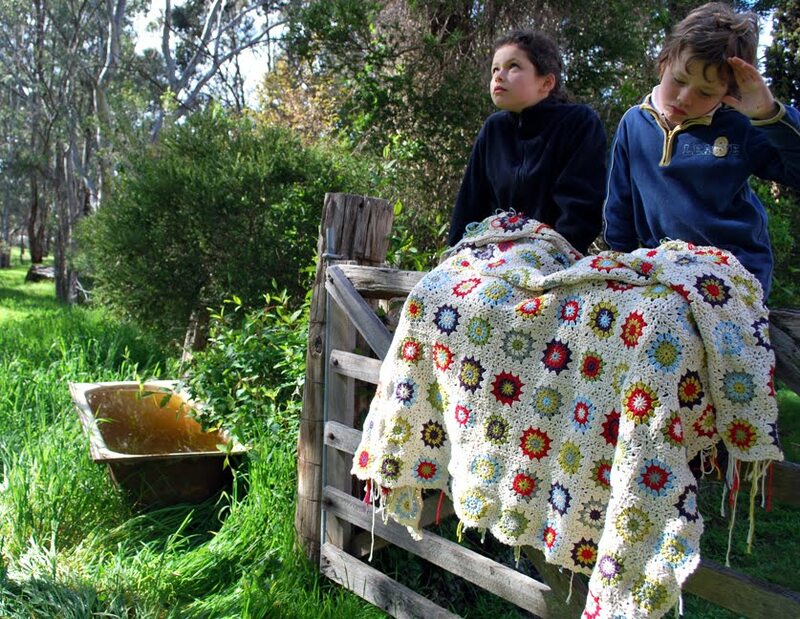 The blanket is gorgeous Tania! I guess it is like running a marathon, you have to train for quite a bit before you finish the actual race. Just think of all those ends being woven in as training and then you can relax under the blanket with your kiddos! I am sure they will have smiles on their faces once your finished! It looks amazing and I have faith that all those ends will be woven in by this time next year. Eeek! Maybe that's why I can't seem to learn to crochet. Can you bribe the kiddies into weaving in all those ends??? It does look beautiful but I'm a cut the ends off girl because I'm too , too lazy ! It's all worth it Tan...and if nothing else you will have a beautiful blanket and have learnt to never make one again..particularly in pesky cotton! Oh boy will it be wonderful when it is done, even if you hate it by then! I love that blanket so much. 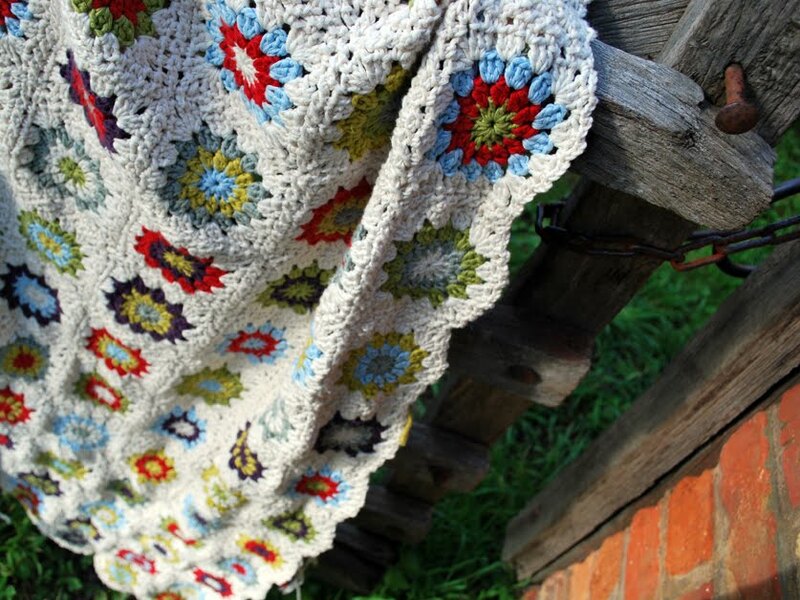 If I ever make a granny blanket (and I hope I do) it will be this one. Yours is beautiful, those ends do look slighlty terrifying though. I am impressed, it is beautiful and when you finish it, bung it in the cupboard for three months then when you take it out your love for it will be restored. Well now, I was rather hoping that you weren't joking, I would be fascinated to see how you would go about it, well for the first go 'round anyway. See, the lesson I learned, was to crochet the ends in as I am making a granny and then snip off the excess. I hate the joining up. It looks drop dead gorgeous though! Love the photos. it's glorious, well done. I'm sure it will finish itself off soon. ok, gone is my smug "I am only using one colour for each square" smile - replaced of course, with dead pan, gobsmacked, "oh my goodness that blanket is gourgeou!" Great work! L.O.V.E it. Truly, madly, deeply. The weaving in, not so much. Oh, wow. I'm sorry, but please do go insane if you must, because you just have to finish it. It's absolutely gorgeous and can't be left undone. Even if it takes 27 years. The blanket looks so amazing! at least all that tedious work will produce a pretty awesome family heirloom!!! It looks stunning. Leave the end as they are and anyone who wants to snuggle under it had to weave in some ends while they do. I'm sure you've stopped 'seeing' it by now but it really is the most fantastic and beautiful thing. And I'm sure like childbirth you will have forgotten all the hard bits soon after its finished and be ready to start the next! An all round satisfactory result. It's gorgeous! But, you have me completely convinced to postpone granny quilt making until I am indeed a granny. OMG Tania, you can post as many photos as you like, I love it, it's STUNNING beyond words. Also wanted to say, I love the way you write. Can't remember how I found your blog, but I'm absolutely entranced. Beautiful. The blanket is beautiful... even with all those ends hanging out. Gorgeous. 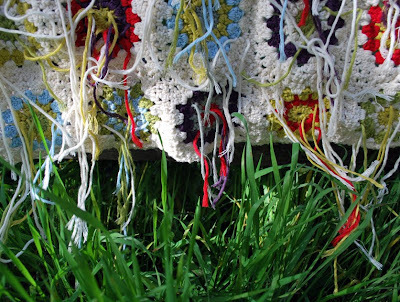 ... why not adopt a post-structuralist approach to granny square throws and just leave all the ends as they are. It could be a metaphor for something???? i don't know anything about those ends..but those pics are wonderful! And it's so very pretty!!! Ends ... what Ends ??? Aren't they called a fringe? Wow, it's incredible! I have just started on mine... 3 squares down... now I'm thinking maybe it's not such a good idea.... On the plus side, I'm weaving in ends as I go along! Oh my goodness! Labour of love, or what! Well, it looks lovely, and I'm sure it'll be completed before you're a granny, and treasured long afterwards. NOW this is BRAVE!You deserve a huge BRAVO for making such a beautiful piece and kept going for sooo long! I think that would have been turned into a bath mat or a brooch :)... with my patience for long projects! It looks wonderful. 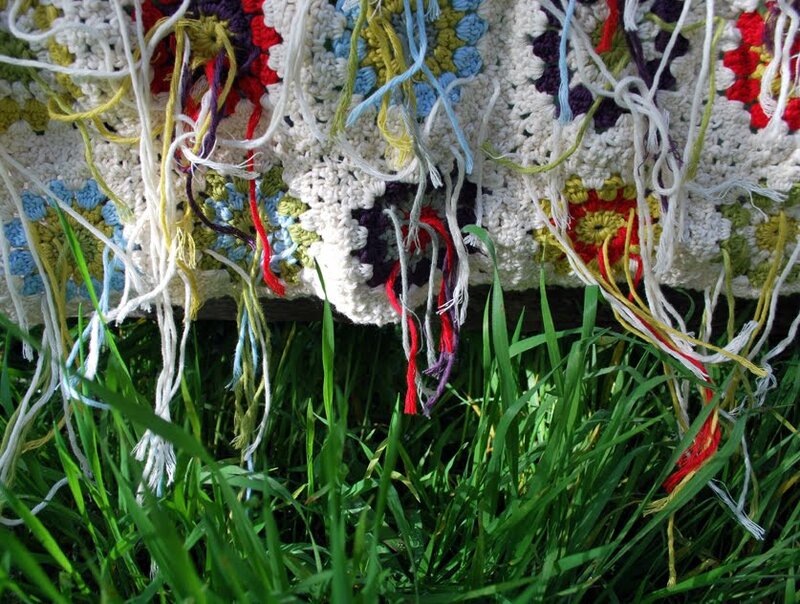 Maybe if you leave it out under a tree for a night some little weaving in fairies will come and do it all. Or perhaps I'm verging on insane too. Wow. I am impressed. I know I do not have the patience for a project of that magnitude! I would be rocking, crying in a corner by now. Hats off to you, sister. looking beautiful Tania but I have two words for you - ripple blanket! Your blanket is gorgeous and I couldn't resist showing it off on Cuteable this morning - hope you don't mind? Oh stick with it! It's so so very delightful! And you'll look dashing in the nursing home swathed in that. What a gorgeous blanket - oh, those ends to weave in - my least favorite part too. 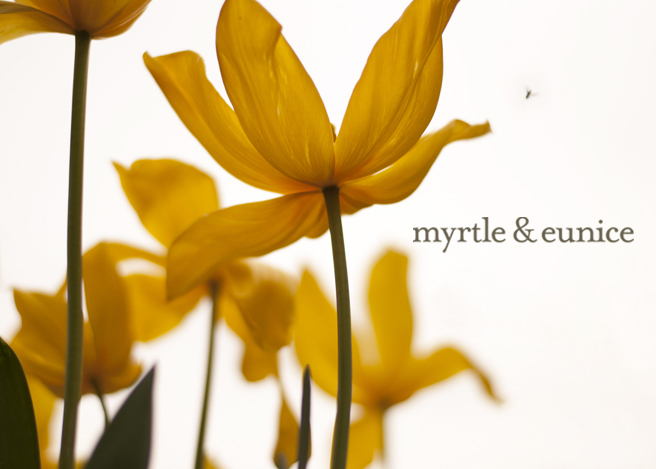 Glad to have found your beautiful blog. I'm very glad you came to see my blog from so far, ha ha ha!!! 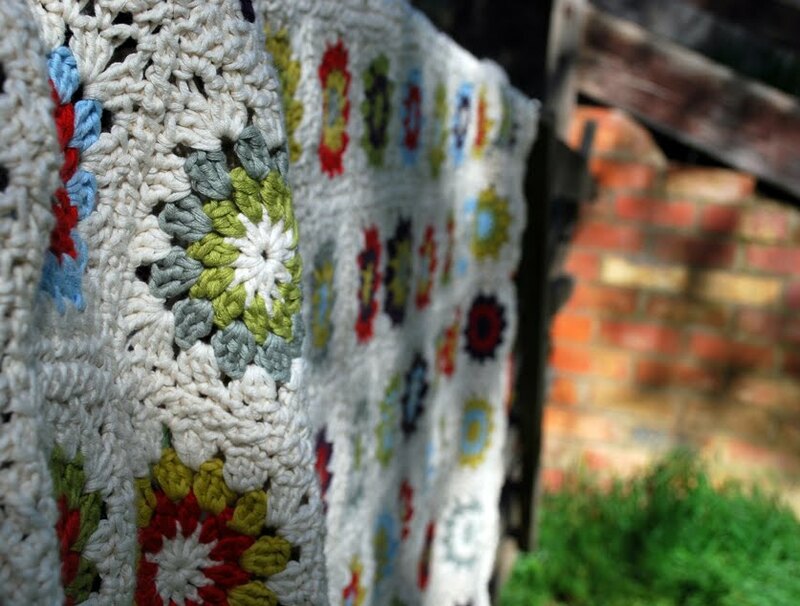 ...did you see my "granny square" some post ago?? Ah yes this project. I saw that photo too and started the blanket. I'm using the most wonderful soft and colourful italian baby wool (3 ply no less!) - and therein is the catch. The company that produces said beautiful soft colourful baby wool seems to have gone bankrupt and did I buy enough of the white to complete the blanket? I think we all know the answer to that is "No". So until I can find an acceptable substitute my granny squares are on hold. Oh I LOVE this blanket! What gorgeous colours. i personally, can't wait to see it finished...I know you can do it! I vote you use your child labour to weave in those ends. I make voor my child a Grannyplait to.